I try to always have a stash of elderberry syrup on hand during winter. It is definitely one of the better tasting herbal remedies, one I can manage to sneak into the whole family. In the UK and Europe, elderberry has long been revered as a valuable hedgerow medicine. It has been used since ancient times for all manner of ills. In England, it was referred to as “the medicine chest of the country people”. Today, scientific studies have shown that the berry does indeed support our immune system. It is antiviral and significantly shortens the duration of cold and flu symptoms. It also has the ability to ward off these viruses if taken in large enough doses, early enough. Add to this its antioxidant and anti-inflammatory properties, it is a herb truly suited to the winter months. Elderberry syrup is my favourite antiviral remedy and fermented garlic and honey is my favourite antibacterial remedy for winter colds and flu. The garlic and honey remedies back up the elderberry to prevent or in case of a secondary infection. Since our move interstate, I have not found a good elder foraging spot yet. This winter I am relying on quality dried certified organic elderberries that I purchased from a trusted supplier online. Half a kilo usually gets us through a bout of sickness or threatened sickness for our family of four. I have actually found that having a stash of dried berries in the pantry is very handy. They keep for a couple of years and are ready to go when illness threatens or strikes. I wish I always had a batch made up however this is rarely the case in our busy household! Place elderberries in a saucepan and pour over the water. Leave to soak overnight - you can omit this step if you need a batch in a hurry! Next day place the saucepan on the stove and bring the berries and the water to a gentle simmer. Place a lid on top of the saucepan and leave to simmer gently for 30 - 40 minutes. 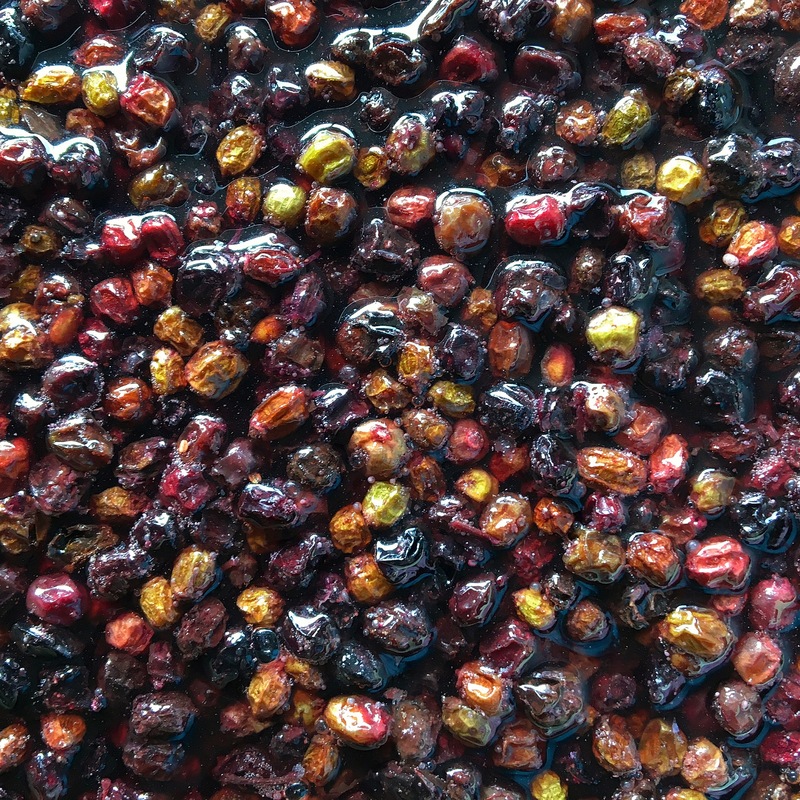 Allow to cool down to warm, not hot and then strain the berries from the liquid using a fine sieve or nut bag. Ensure you force as much liquid from the berries as you can. Compost the berries or feed them to the chooks! Add honey or sugar to the elderberry liquid to your taste. Remember the berries are tart so the syrup should have a sweet and sour taste. I generally add only about 1/4 cup of honey however you might need to add more, adding more will also lengthen the shelf life of the syrup. Store in closed glass bottles in the fridge for up to three months. If you even think you are getting a cold take 2 - 3 tablespoons three to four times a day. Children three to twelve can take half this amount. Children under three should not take this remedy unless under supervision of a health professional. Keep taking this dose until symptoms have subsided. Use your common sense, if your symptoms are not subsiding after a day or two or getting worse it is time to see your health professional. Enjoy making your stash of Elderberry Syrup from Dried Elderberries! Looks yummy! I wish I had a little dose of those a few weeks ago before I got struck down with mum flu.